The International Energy Agency recently released a report on how carbon capture and storage (CCS) could account for 19 percent of the greenhouse gases emissions cuts needed by 2050. The IEA specialists believe Mankind would need to install up to 3,000 plants by 2050. This however might prove to be a problem as CCS is not completely ready yet and this albeit the numerous tests around the world. Halving the world’s greenhouse gases emissions by mid-century is indeed a challenge as the energy consumption is due to at least double meanwhile. Albeit the horrendous cost of CCS – around three trillion US Dollars over the next four decades – the organization notes that it would represent only six percent of the sum needed to halve global greenhouse gases emissions. Yes you read it right : six percent of the total would bring 19 percent of the emissions cuts. Among the other solutions enumerated by the agency are nuclear power, renewable energies and efficiency. 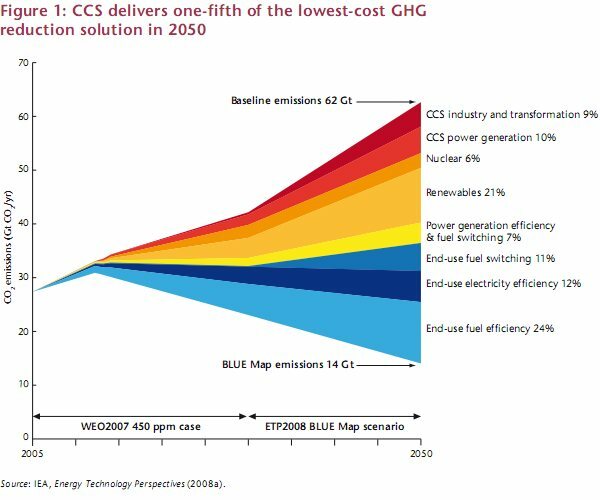 Back to CCS : even if wealthy nations will have to invest massively on carbon capture and storage during the next ten years, the vast majority of such systems will have to be installed in developing nations as they are due to account for the quasi totality of emissions increases. Carbon capture and storage is often associated to coal-fired plants, the most polluting energy source. The IEA notes however that CCS would also have to be installed to gas-fired plants and other emitting industries. You may also refer to these articles by the New York Times and TreeHugger.